"Delicious spicy marinated shrimp. Easy on indoor or outdoor grill. I serve this with yellow rice and/or baked potatoes. I also put an extra shot of hot pepper sauce on the rice, love it spicy!" Mix together the garlic, chipotle peppers, lemon juice, olive oil, paprika, cilantro, kosher salt, black pepper, red pepper flakes, and cayenne pepper in a bowl. Stir in the shrimp, and mix well to thoroughly coat. Marinate for 30 minutes in refrigerator. Remove the shrimp from the marinade, and discard excess marinade. Thread about 5 shrimp per skewer, and grill on the preheated grill until the shrimp turn pink and opaque in the center, about 2 minutes per side. 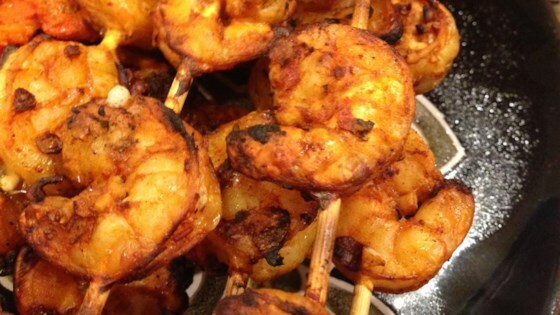 See how to make a simple, spicy marinade for truly memorable grilled shrimp. I made it according to the recipe but it was too spicy for my non Hispanic guests. I didn't particularly like the flavor. I used the baked potato side as suggested and that made it tolerable. Amazing recipe. I didn't have a grill nearby so I baked them at 425 for about 10 minutes. I also cooked some spanish rice along with and then served as burritos. By far the best shrimp I have ever made. Followed recipe exactly except cut in half. Will use this again and again! !